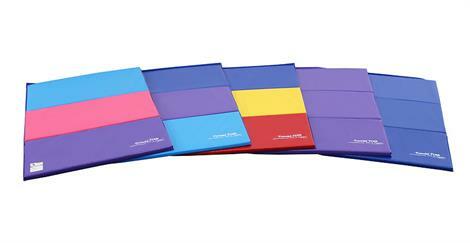 Tumbl Trak™ Tumbling Mats are the highest quality gymnastic mats available on the market today. Our mats do not contain lead and have passed all testing requirements enacted by the Consumer Protection Safety Improvement Act of 2008. 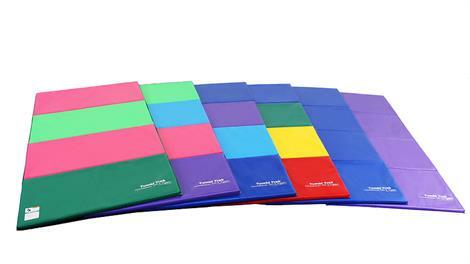 Competitively priced, our gymnastic mats will ship from our warehouse within 2-3 business days. Fresh, new colors are now available and come with Velcro™ on two ends.They are made with crosslink foam, covered with 18 oz. vinyl and stictched together with high quality dacron thread. Our mats will last for years and years. AVAILABLE COLORS: Bright Pastel Rainbow, Purple, Primary Rainbow, and Royal Blue and our NEW Blueberry Explosion and Watermelon colors! 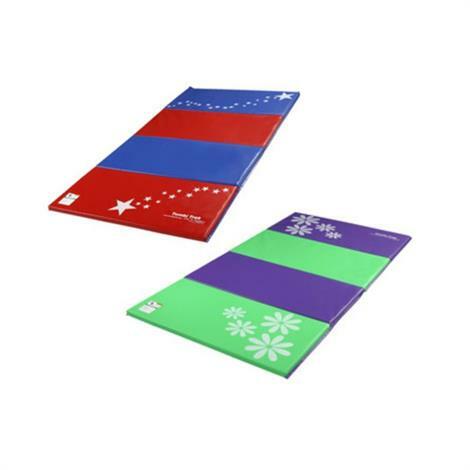 Designer Mats include Flower Power, Stars and Stripes and Black with 4 sided velcro. (Note: The Watermelon Mat is available in the 4'x8' size only). 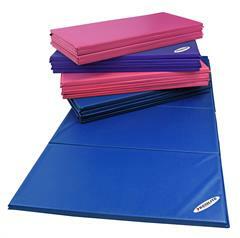 PARENT TIP: Also called Panel Mats because they fold into 2ft wide panels, the tumbling mats are firm for surefooted tumbling. They are not appropriate for cushioning falls or landings.